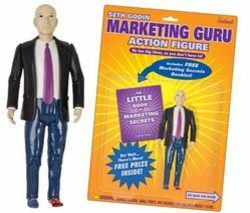 I recommend Seth Godin's posts to all entrepreneurs (not just microbudget filmmakers). But Seth's advice sometimes reads like a road map for filmmakers struggling with the new paradigms of financing and digital distribution. For example, Seth's recent advice about getting started ("Once you realize that you have all the tools and all the permission you need, then opportunities to contribute abound. No one is going to pick you. Pick yourself.") is spot on for non-studio filmmakers.